Save on space in your shop's main night safe with Securicash Cash Drawer Safes. Designed to accommodate typical-sized cash drawers, these safes are built from solid steel and come fitted with secure VdS approved key locks. These include 6 lever locking and a dead bolt. Each door is opened by a separate key, allowing you total control over access and giving increased security. Storing your cash drawers in the Securicash Cash Drawer Safe reduces the need to open your main safe, which in turn means greater security for its contents. Cash drawers can be counted, compiled and then stored in safety. Predrilled holes in the rear and base of the unit allow for wall or floor anchoring. Nylon plugs and screws are included for anchoring. 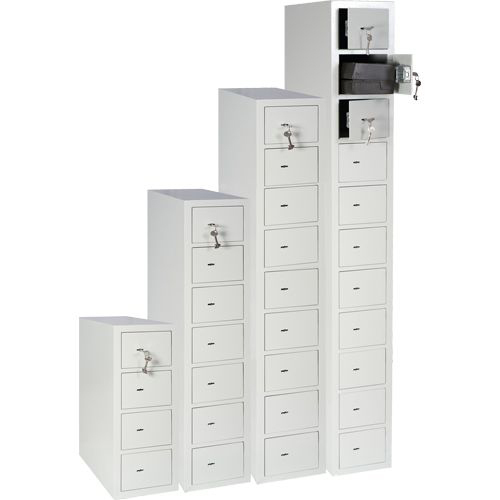 Available in four sizes, ranging from 4 drawer to 11 drawer units, these safes can be connected to each other, allowing them to grow with your business.